While you’re designing your new home extension, keep in mind covered patio ideas to help stay dry from the rain and shaded from the sun. Whether you chose to build a covered deck or patio, awnings and outdoor canopies compliment both nicely. Plan the roof prior to finalize your building plans. 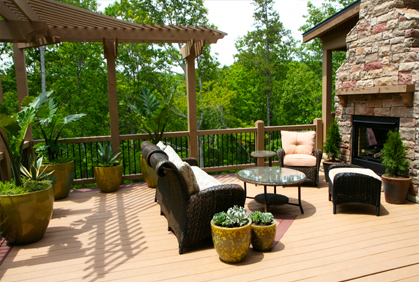 Popular deck designs use a two tiered approach, with the covered patio ideas a step higher than the rest. Under deck patios use the same structure layout and make for excellent wood or metal awnings. 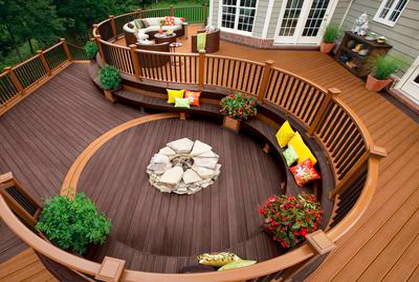 If you haven’t decided between a designing a deck or patio plan, you have many things to take into consideration. The type of material you build will play an intricate roll in the design plan. Elevated deck plans are ideal for above ground pool decks with a backyard second level entrance and stairs to your house. 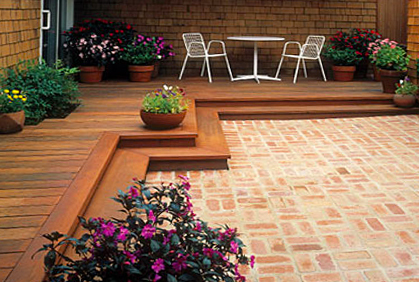 If the landscaping space you’re working with is tight, a small patio design is better than a space stealing deck. Of course there’s the option to combine both and design under deck patio ideas. 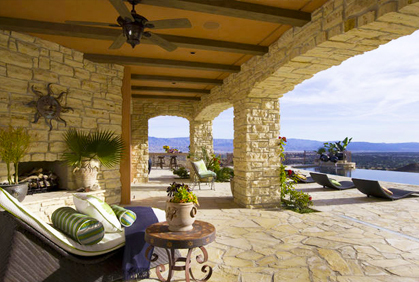 Popular today is building a patio with pavers as opposed to traditional concrete. After you sort through the pictures, it’s time to sketch your deck design ideas on paper or using drawing software free downloads. The traditional way is actually drawing with a pencil like an old school architect. Graph paper makes it easy to keep track of your actual backyard dimensions. 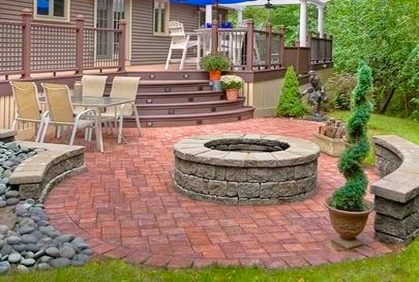 Instead of sketching on paper, we recommend downloading free patio design software online. There are many free design programs available for landscape design that include patio and deck ideas. You can also find some hefty paid versions and professional licensed programs that really take home designer software to a whole new 3D level. Once you get the free deck design software and online patio designer tool downloaded up and running, enter the dimensions of your backyard landscape and let the software do the rest. Another consideration before you start designing your patio landscape is whether you have plans to build a pool now or in the future. Both patios and decks act as the best transportation method between your house back door to the water. Pools above ground call for an elevated deck design eliminating the need to climb a ladder before swimming. On the contrary, in the ground pools have the best layout for a low level patio design. Whichever direction you go, keep in mind the pool deck paint coating you use and many are slippery when wet and don’t hold up well from warping. Pool deck and patio paver makeovers are the popular choice for inground pools, withstanding durability and impressions. Check out our large selection of patio and deck designs pictures ideas to find the best roofing style for your small yard ideas. Over time, concrete will crack and need much more repair versus long lasting paver stone layouts. 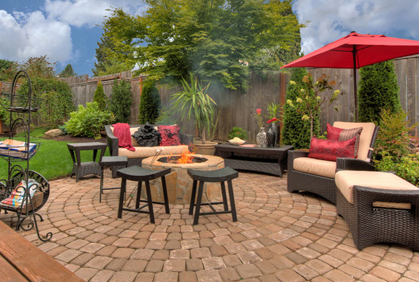 Patio pavers not only look gorgeous, but also rarely get damaged from bad weather over time. What better to tie in your landscape design ideas for backyard than a new deck and patio with stylish teak outdoor furniture? Ideally, this is an early stage of your patio landscaping plan with a swimming pool as the exception. Learning how to design the backyard layout with free deck building software will get complicated enough without having to plan around trees, plants, and shrubs. First things first, measure you backyard and draw a small patio design or diy deck plan on paper. While measuring the dimensions, walk around your yard and see how much land you have to work with. Then sit with your household and look through as many free outdoor patio deck design pictures as you can find. Download our free backyard design software program to find the right custom layout to fit your yard.